The world’s best photographers depend on the best equipment to deliver consistently stunning and remarkably detailed shots, and the D3X, with its 24.5 megapixel FX-format CMOS sensor, promises just that. Capture every color variant and every subtlety, and bring them to life right in your hands. Customize the D3X’s settings to suit your style or adjust for any situation, whether in the studio or in the field. You can always expect breathtaking image fidelity and unbelievable richness in every demanding commercial application. Every image the D3X captures is jam-packed with life, sharpness and brilliance. The sensor's 24.5 megapixels are only the beginning. No matter how you shoot—tightly controlled or on the fly—the camera's phenomenally wide dynamic range retains subtlety of shadow and highlight detail that contributes to breathtaking image fidelity, which can make the difference between good pictures and exceptional ones. Images with the X-factor are what your clients expect and your reputation deserves. Nikon's EXPEED processing system is much more than a mere label or processing chip component. It’s designed specifically to meet the requirements of a 24.5-megapixel sensor. The results will exceed the expectations of any commercial or fine art photographer whose work requires extreme resolution, rich tonal gradation, outstanding color accuracy and remarkable detail. The D3X captures the entire spectrum of color and every intricate detail, adding so much life and reality to your photos they rival real life. Selectable bit depths of 12 bit (4,096 tones) or 14 bit (16,384 tones), both yielding incredible image quality through a 16-bit processing pipeline, for smoother tonal gradations. Designed for fashion, portrait and landscape shoots, where large image files and an extreme attention to detail are required, the D3X provides crisp and clear shots with a broad dynamic range. Expand the ISO sensitivity from Lo-1 (ISO 50 equivalent) to a higher setting of Hi-1 (ISO 3200 equivalent) or Hi-2 (ISO 6400 equivalent) for versatility and more detail in low light or night situations. Live View delivers tremendous creative freedom for a broad spectrum of shooting situations, from still life in a studio where precise focus is essential, to outdoor environments where you may not always be able to physically see your subject through the viewfinder. The D3X adds even more flexibility with two Live View modes: Tripod and Hand-held. With the Tripod Mode, acute focusing accuracy is easily confirmed with up to 27x magnification. Commercial image quality teams with speed and handling to create new shooting possibilities—in the studio or on location. Stay on your toes and don’t miss a scene-stealing moment with continuous shooting of up to 5 frames per second, leaving you with countless colorful and astonishingly true to life pictures. The D3X’s fast, accurate 51-point autofocus system features 4 Dynamic AF modes, including 3D Focus Tracking, for autofocus precision and razor sharpness. The exclusive technology of the 1,005-Pixel 3D Color Matrix Metering II with Nikon’s Scene Recognition System provide intelligent auto exposure capabilities, along with refined auto white balance detection and faster, more accurate AF performance. 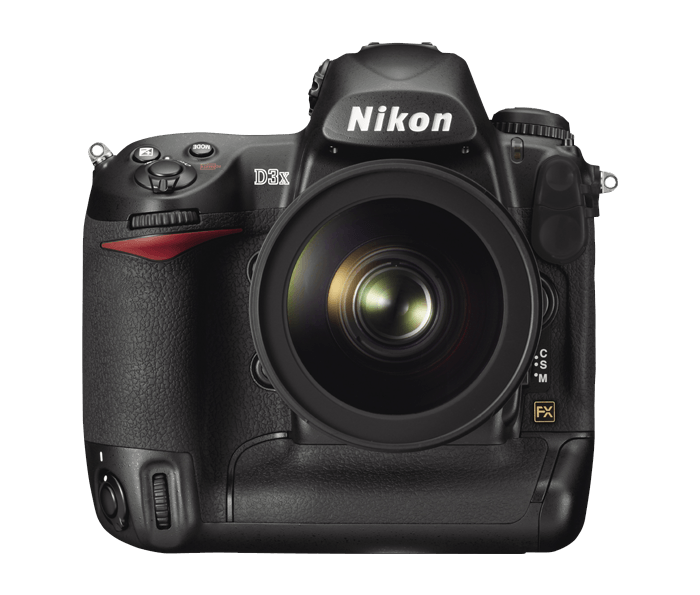 The D3X features an expansive 3-in. VGA LCD monitor with reinforced glass. Its approx. 921k-dot resolution assures clear, detailed display of images, which proves invaluable when confirming focus or assessing image sharpness.